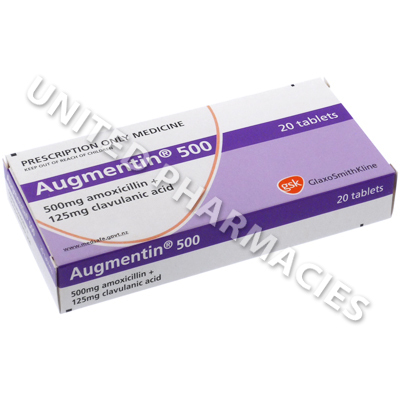 Augmentin (Amoxicillin Trihydrate/Potassium Clavulanate) is indicated for bacterial infections. It is considered to be less susceptible to resistance due to the addition of potassium clavulanate (clavulanic acid), which helps some penicillin type medicines overcome antibiotic resistance. Augmentin (Amoxicillin Trihydrate/Potassium Clavulanate) is indicated for bacterial infections. It is considered to be less susceptible to resistance due to the addition of potassium clavulanate (clavulanic acid), which helps some penicillin type medicines overcome antibiotic resistance. This is as a result of it functioning as a beta lactamase inhibitor, meaning that it is able to render inactive the enzymes in bacteria which make them resistant to cephalosporin and penicillin antibiotics. As a result of this, amoxicillin's spectrum of activity can be greatly increased, and its efficacy against many bacterial microorganisms resistant to amoxicillin may also be restored. Patients suffering from infections of the lower respiratory tract, urinary tract, otitis media, sinusitis, soft tissue or skin infections and various other infections caused by susceptible microorganisms are often treated with this medicine. The combination of ingredients in this medicine is sometimes referred to as co-amoxiclav. Augmentin (Amoxicillin Trihydrate/Potassium Clavulanate) is provided as tablets for oral administration which contain 500mg of amoxicillin and 125mg of potassium clavulanate. They are administered by mouth. Your doctor will carefully calculate the dosage based on how severe the symptoms of your infection are. Adult patients are sometimes directed to administer one tablet twice per day (if the symptoms are mild to moderate in nature). Complicated urinary tract infections or other severe bacterial infections may be treated with a slightly higher dosage, and it is possible that the patient may be told to take 1 to 2 tablets 3 times per day. Because the exact dosage can differ depending on the circumstances of the infection, patients will need to strictly adhere to all instructions given by the doctor in charge of treatment. You must report all side effects to the doctor who is treating you. Although less common, serious side effects can occur. Get medical assistance immediately if you notice bloody diarrhoea, bruises on the skin, weak muscles, numbness, seizures or any other severe side effects which have not been listed here. There have been reports of patients experiencing colitis (bowel inflammation) due to treatment with broad spectrum antibiotics. If you suffer from severe or ongoing diarrhoea, either during treatment or after you have finished taking it, see your doctor immediately. This antibiotic medicine can affect the results of urine or blood tests. Inform the doctor testing you that you are being treated with this medication if you are undergoing any medical tests. Always use Augmentin (Amoxicillin Trihydrate/Potassium Clavulanate) as you have been prescribed by your doctor. Never self-medicate or change your dosage without first consulting your doctor. The correct dosage can vary depending on your health, medical history, and the severity of the condition being treated.